Expand a single USB 3.0 port into 4 ports. Sync Data at Super Speeds up to 5Gbps(USB 3.0), 480Mbps (USB 2.0), 12Mbps (USB 1.1). Transfer HD movies in seconds. Weighing about an ounce and super mini, this JoyReken Ultra Slim Hub is designed to be as portable as possible. A perfect lightweight travel tool, this compact hub tucks easily into the pocket of your laptop bag. This 4-Port USB 3.0 Hub will not charge an iPad (it will only sync). Big Expansion: Instantly Add Four USB 3.0 Ports to Any Compatible Device. Ultra Portable: Just 0.35inches Thin and Weighing around 1ounce, Making it Easy to Grab and Go. SuperSpeed Data: Sync Data at Super Speeds up to 5Gbps(USB 3.0), 480Mbps (USB 2.0), 12Mbps (USB 1.1). System Supports: Compatible with Windows 2000/XP/Vista/7/8/8.1/10, Mac OS X, Linux and Chrome OS. 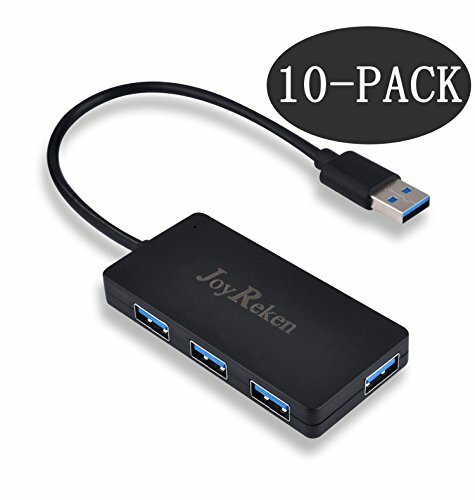 What You Get: 3-PACK JoyReken Ultra Slim 4-Port USB 3.0 Data Hub, Welcom Guide and Friendly Customer Service. If you have any questions about this product by JoyReken, contact us by completing and submitting the form below. If you are looking for a specif part number, please include it with your message.